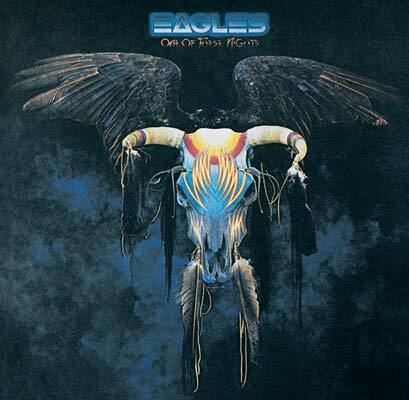 Eagles – One Of These Nights | Gary Burden for R. Twerk & Co. This was the fourth and last cover I made for Eagles. I am grateful for the amazing times we shared, from before they were signed to a record label to the crazy, psychedelic, American Indian Shaman magic, mind bending adventures on our trip to the desert for the first album cover. Historically hilarious. They are without a doubt some of the funniest human beings I have ever met. This album came at a time when the band and the music was poised to make a seismic shift from folk/country/rock headed towards a more polished and sophisticated music and “look” that culminated with Hotel California. I decided to focus on the front cover and create a magical talisman to represent and express the powerful dark magic of the band and the music. I went to a friend, artist Boyd Elder. I wanted to use one of his pieces for the cover and have him do the lettering for me. Boyd is a guy I first met before I got involved in rock and roll when as a designer at an LA architectural firm it was one of my responsibilities to buy art for installation as a part of our interior spaces for a series of bank buildings we were designing. I use to go to the local art colleges to scout for good promising young artists. Boyd was one of those people and later on our wives and children were all a part of our extended “family” along with dear friend Rick Griffin (RIP) and his wife and daughters. Boyd and I worked together often over the years. I did a version of this by stippling in my high school art class (many many years ago). This has to be my very favorite album cover of all time. This is a very hauntingly beautiful image. I Love That The Album Opens From The Top. Was That Your Design? Very Unique!. I Also Like The Messages Engraved In The Lp. The Font Set The Tone For Future Albums. What A Great Lp. I Purchased It In 1980 And Still Pull It Out When I Listen To Them. Do You Have Any Other ArtWork Or Similar Images To Be Displayed? Great Job For One Of My Favorite Bands.